The installation is a 3D representation of the 100 year history of the UMN's School of Architecture that will be one of several exhibition pieces featured in UMN's upcoming 100 year anniversary celebration in October. 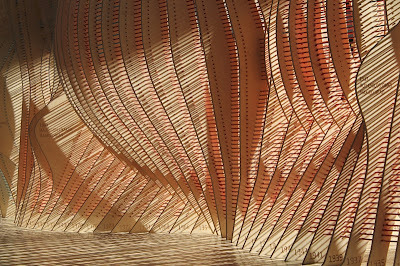 The model was designed in Rhino/Grasshopper informed by data about the school's history. Primary designer was Adam Marcus who has been the Cass Gilbert visiting fellow for the past two years. Nesting and RhinoCAM + machining and assembly by Masters of Architecture students Dan Raznick, Jordan Barlow and Sam Daley. 8080 pencils (the different colors represent various degrees granted), ~17,000 holes, 36 sheets 1/2" baltic birch. 8' x 8' x 38'. Ten to twelve people can pretty much pick it up and move it. UMN RhinoFabLab technicians consulted along the way, checked out the router occasionally while they were cutting and tried to make sure they didn't break anything. More photos about this installation can be seen here.